In a new age of childbirth, mothers-to-be are requesting a more natural approach to their birth plan. The progression in traditional caesarean-section has seen mothers deliver their own babies with doctor’s assistance. Numerous medical studies have promoted the benefits of the natural approach to childbirth, such as immediate skin-to-skin contact and early breastfeeding initiation. Doctors are now seeing a move towards this different kind of C-section, which is been described as “women-centered,” as they allow for mother and baby to have instant contact. In what is a great testimonial for Dr Neil Wallman and John Flynn Hospital, a natural caesarean was recently performed for one mother who had the privilege of delivering her own baby. A natural caesarean experience is one that closely mimics what happens during and immediately after a natural childbirth. This involves witnessing the delivery, holding the baby and breastfeeding immediately. In essence, a natural caesarean keeps the mum and baby together as much as possible. Dr Wallman performed the natural caesarean after months of careful planning by himself, the hospital and mother-to-be. 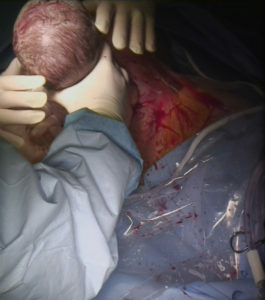 Following the incision by Dr Wallman, he moved the baby’s head and shoulder into the position for the new mum to reach down, grasp her baby boy’s shoulders and pull him out. You can see this moment in the image to the right. She was then able to lay him on her chest and share his first moments. While it is normal with a natural birth to allow the mum and baby to have immediate skin-to-skin contact and bonding time, it’s very uncommon with caesareans. Dr Wallman said he believed it was the first time a natural caesarean at John Flynn Hospital had skin contact during the operation. In spite of the amazing events which were unfolding, Dr Wallman said the atmosphere in the room was extremely relaxed as the events went exactly to their carefully laid plans. “When the new mother approached me about this initially, I wasn’t so sure about it,” Dr Wallman said. “But the more I thought about it, the more I realised how amazing this would be. “It took a lot of very careful planning, but it was so worth it for the end result. “We had to be very careful that the mother was properly sterilised, so this took a lot of care and planning. The complications of the surgery room make incorporating natural strategies a little more difficult. However, the natural approach doesn’t involve anything different, simply a coordination of care with the nurses, anaesthesiologist and paediatrics team. The only components that differentiate a natural C-section experience from a normal C-section is the preparation and coordination of the childbirth. The implications are no greater than a normal caesarean. The natural caesarean is not commonly offered for the fact that many doctors simply aren’t aware of the option. John Flynn Hospital and Dr Wallman are no strangers to more controversial deliveries. 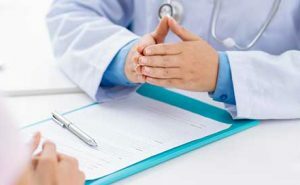 Dr Wallman has more than 30 years’ experience and offers the highest expertise in care and management for expectant mothers, including water birthing, calmbirthing and hypnobirthing.